A few months ago I became a member (友の会) of the Japanese National Museum of Nature and Science. One of the benefits of being a member is that you have free access to the installations any time of the year. In particular, this is useful if you plan to attend seminars and workshops organized by the museum. A month ago I participated in a workshop organized by professor Fumitaka Wakabayashi. 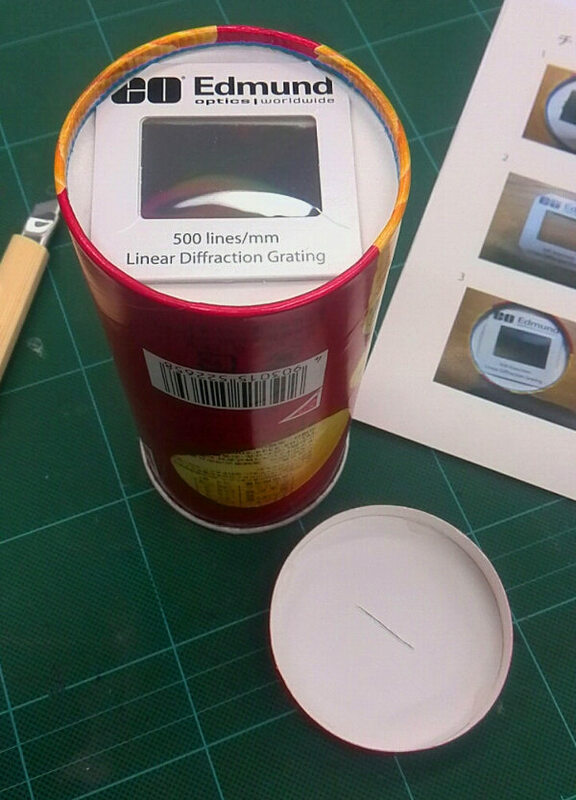 The topic of the workshop was building a periscope-type DVD spectroscope. The main body: made out of a sheet of card stock (the internal side should be black). 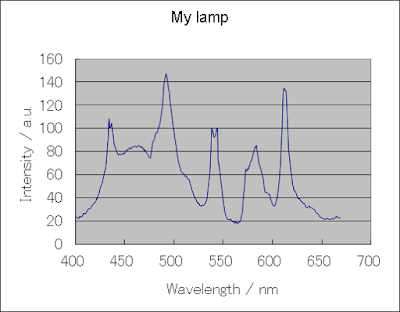 The spectroscope pattern can be downloaded here. A 45° (1/8) sector that was cut with scissors from a cheap DVD after heating it at 60~70°C. This is used to refract the observed light source, in a similar fashion as a prism. You can use methanol to clean the surface. A 15x15mm mirror plate (available at Tokyu hands with the name ミラープレート) or alternatively an acrylic mirror. 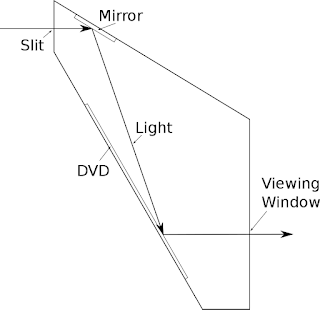 Double-side sticky tape: used to fixate the mirror and DVD onto the main body. The way the spectroscope works is very simple. The light whose spectrum we want to measure enters through a slit (a very thin hole) into the spectroscope, and gets reflected in our mirror. 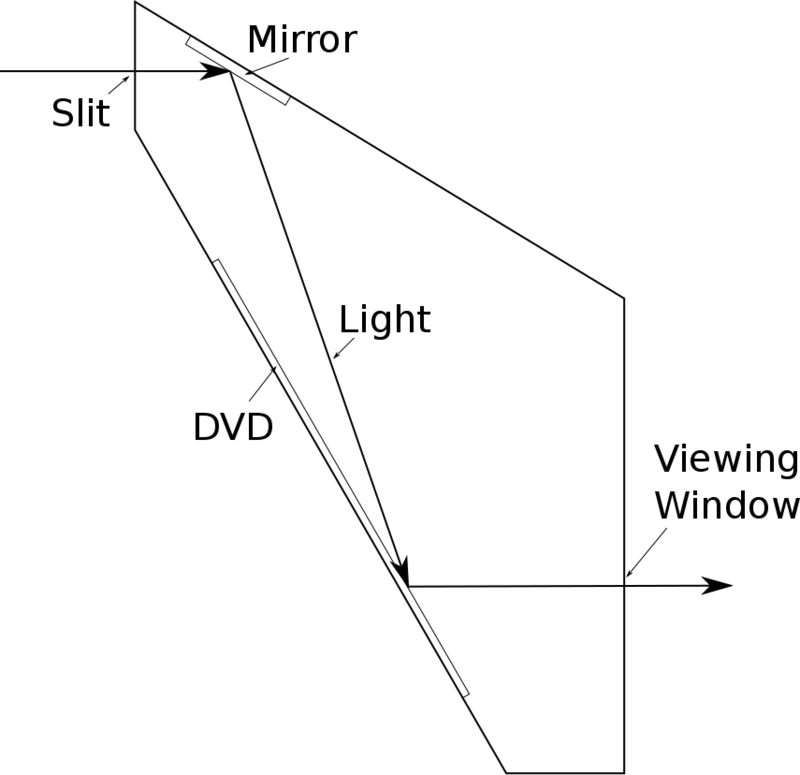 Then it travels towards the DVD sector, where the light gets refracted. On the viewing window we can install a camera (e.g. : your smartphone's camera) in order to capture the spectrum of the light. For instance, this is the spectrum of a Toshiba FHC34ED-Z lamp as captured from my smartphone's camera. Image>Transform>Rotate: straight up the image so that it is horizontal (or vertical). You can check the "preview" checkbox for an interactive manipulation. Also, make sure that blues (lower wavelength) are on the left (or top) of the picture. Analyze>Plot profile (Ctrl-k, or Ctrl-Alt-k if the image is vertical): a intensity graph appears. 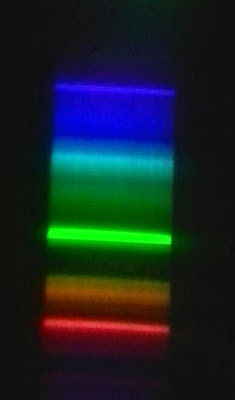 Convert pixels to wavelength(nm) by identifying well-known wavelengths (e.g. : 404.6565nm, 435.8335nm, 546.75nm, 576.961nm, 579.067nm). You can do this with Analyze>Calibrate in ImageJ or with a spreadsheet/script able to calibrate the wavelength of the spectroscope. 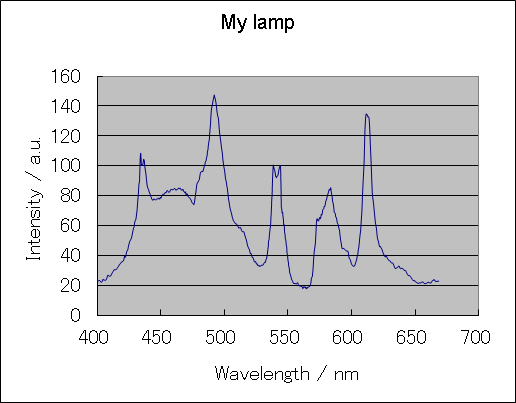 Finally, you can check your lamp's catalog and compare the spectrum you got and the one measured at the factory. There are other ways to create a simple spectroscope. 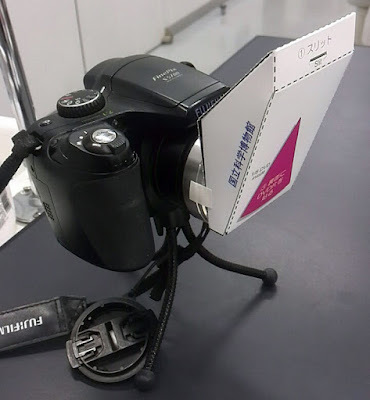 For example, I built the one above using a chips box and a linear diffraction grating sheet from Edmund optics during another session at the Japanese National Museum of Nature and Science. 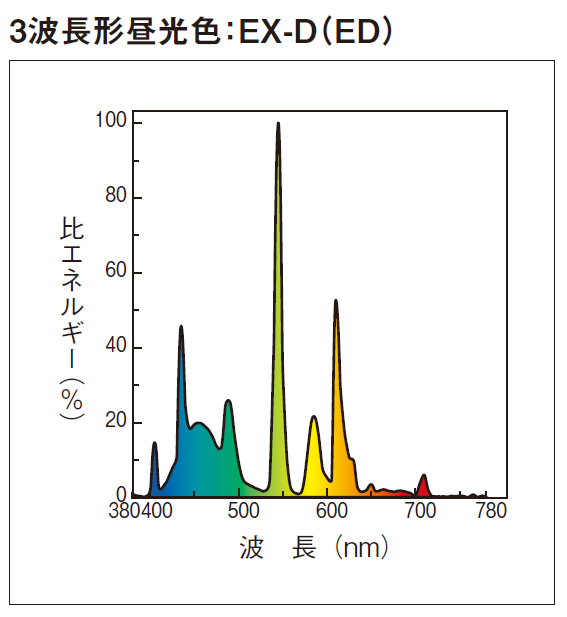 Fumitaka Wakabayashi, Kiyohito Hamada, A DVD Spectroscope: A Simple, High-Resolution Classroom Spectroscope, J. Chem. Educ., 2006, 83 (1), p 56. Fumitaka Wakabayashi, Resolving Spectral Lines with a Periscope-Type DVD Spectroscope, J. Chem. Educ., 2008, 85 (6), p 849.